playing days at East Carolina. Kevin Walker always knew that he liked to work with his hands. So it should come as no surprise that as a football player, Walker – better known as K.K. – was ultimately defined as a player by those hands. Yes, there was speed and physicality, but it was his nose for the football and his receiver-like hands that stood out to the Pirates fans who watched him play in the early-to-mid-1980s. 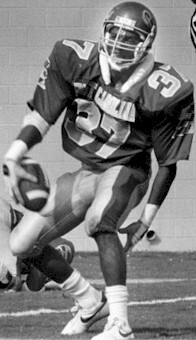 By his senior year, in 1985, Walker was one of the top corners in the country and he finished as the nation’s interceptions leader. It's important to note that those picks came against some of the best quarterbacks in the nation as the Pirates shied away from no-one when it came to scheduling. Regardless of who was lining up under center for the opposing team, though, the INTs kept coming. In many ways, Walker's hands have helped drive his life, metaphorically speaking. It was his hands that brought him to ECU, landed him in the NFL draft and took him to the Tampa Bay Buccaneers. And with those hands, in his last game as a pro, almost by fateful design, Walker intercepted two passes. Finally, it was his hands, the desire to use them, that led Walker, after a number of years in the pharmaceutical industry, to embark on the career he always wanted – to build. Surprisingly, his East Carolina experience is less marked by All-America status and leading the nation in interceptions, but more, the degree that he received, albeit slightly later than he’d have liked. K.K. Walker came to ECU in 1982 after being recruited by then-defensive backs coach Ricky Bustle. Coach Ed Emory was building toward the 1983 season and he saw in Walker – a Greensboro prep star – a perfect cornerback. Speed, smarts, desire, and hands like a pillow. But Bustle and Emory made Walker a priority and got to know the Walker family. Walker would end up leading the Pirates’ secondary in interceptions for three straight seasons, finishing his career second only to Jim Bolding in career picks with 19. But in his first year, he dreamed, really, of simply earning the opportunity to go on the road with the team. Walker played his freshman year and felt that he was primed for the 1982 season to solidify his spot in the lineup. As a redshirt sophomore, Walker came into the 1983 season firmly locked into one of the starting cornerback positions in a defensive backfield that revolved around Clint Harris. “Clint was our leader,” Walker said. “He was a true 4.3 (in the 40) guy and he was tops on a team that was the fastest team in the NCAA that year. All the Florida guys would tell us that after we played. We had linemen running 4.7s. Coach Emory had put together the best team and we knew how good we were. With all of the talent on that team, particularly in the defensive backfield, it was Walker who was the leader on the INT tally sheet. The statistics were always there for Walker. So, despite a downturn after 1983, the NFL did come calling. Mainly because Walker not only was the model of consistency over his three years as a Pirate starter, but also because his nine picks in 1985 lead the nation. Namely, his three interceptions of Miami’s Vinnie Testaverde highlighted his knack for finding the ball first, ahead of the receiver. But the NFL experience would not be the easiest of paths for Walker. Walker in his days with the Tampa Bay Buccaneers. Walker had worked out for the Dallas Cowboys and Tampa Bay Buccaneers. The Bucs even flew him down to Florida just two weeks before the draft. Walker had performed well at the combines, so there was no indication that Walker wouldn’t be a first day selection. But, as it often goes, the third round came and went without the selection. “Draft day comes and we’re all sitting around in the (dorm) room and the first, second, and third round goes by and I am getting nervous. My agent calls me and says that Tampa called them and were going to take me in the third, but then I hear them trade the third rounder to New England. Then (Tampa) took Craig Swoope (a safety) in the fourth. They didn’t have a fifth-rounder. Finally, the sixth round came and they picked me. Whatever disappointed Walker about the later-than-expected selection, it disappeared when Walker called home. The magnitude of the moment was never lost on Walker, who cherished every minute of his ultimately short career in the NFL. Though it was lost on Walker at the time, it was his performance at the NFL combine, more than the nine interceptions, that got the attention of the pros. After all the tests were said and done, Walker was rated the seventh best player among corners and safeties in the country. 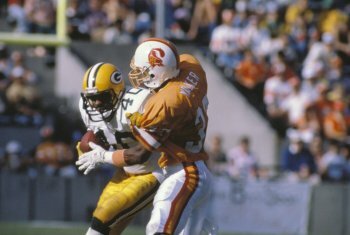 Though injuries would cut his career to just two NFL seasons, Walker’s time in the League was no less memorable. It took the entire preseason camp and schedule before Walker truly believed he would stick with the team. Lehman Bennett was the coach then for the Bucs and he never hesitated to cut a player – veteran or top rookie alike – if he felt there was a better player on the roster. He saw potential in Walker. He had earned a roster spot and was proud of it, though he was acutely aware of how fragile the career of a mid-rounder can be. Walker was quick to point out that in Tampa, everything was first class. The health benefits, the stipends, the travel… all top notch. As it was, after all the work to make the roster, it took one play to end Walker’s first season in the NFL. Walker would miss the next 14 weeks. Looking back, Walker must have felt that the world was conspiring against him. In the short life of an NFL player, many can’t afford even the slightest of setbacks and Walker’s injury paled in comparison to the news he was dealt in 1986. The NFL Players Union went on strike. “You make the team and you go through the injury, and then come back and make the team again and they strike right at the beginning of the season,” Walker said. As a second-year player, Walker felt the sting of the strike right out of the gate. “Yeah… I was a ‘scab,’” he said. “Most of (first and second year players) and all the free agents who had made the team were scabs. And, it hurt really bad to (cross the picket line), but you had to take care of your family. The players knew what you were going through and it wasn’t that bad in Tampa. Longevity is not on your side in the NFL. Most of us could not afford to give up four of five games (checks). As it turned out, rather than the scab reputation, it was an ankle injury that ended Walker’s career. In his final game as a pro, Walker showed the same hawkish pursuit of the football that first gained the attention of the scouts while he was at ECU. In his last game – against Minnesota – he had two interceptions, returning one for a touchdown, and was named the NFC Player of the Week. Ironically, it was a former Tampa teammate, receiver Willie Gillespie, who was the Viking who fell on Walker’s ankle, spelling the end for the corner. Walker hooked on with Detroit and had an impressive preseason and camp. Though he sensed his career was over, Walker did try and get on with other teams and even considered the Canadian Football League. Walker returned to where it started in 1989 and finished his degree. Finishing school, in fact, was on his mind even on the day he was drafted into the NFL. In the big picture, Walker has always seen himself as blessed. After completing his degree, there would be a number of years before he finally found himself using his hands again, at least the way he dreamed. He worked in the pharmaceutical industry for a number of years, stopping at Burlington Industries, Bayer, and Eli Lily before he finally went for it. Today, he is a licensed General Contractor with an ultimate goal of building houses full time. He had always dabbled in remodeling projects, but he is now looking forward to wholesale building in the spirit that first led him to ECU and its IT program. “Building things, using my hands, it has always been my first love,” he said. Walker is very happy these days, spending time with his children and working with his hands. It was never lost on him what ECU contributed. ECU and its faithful got plenty in return from Walker and his hands.